Prior to her discharge, Laura had given permission for the use of her photos and her story. Her name has been changed at her request. Laura is a 28 year old female admitted to Lillington House in August 2016. She had been involved in a road traffic accident on 6th December 2015, in which a high speed car hit Laura. She sustained multiple injuries, right subdural haematoma, left frontal intracerebral haematoma, right occipital fracture, right mastoid fracture, fractured base of skull, right 1st rib fracture and fractured right tibia and fibula. When Laura was admitted to Castel Froma Neuro Care, she was deemed to be in a vegetative state following a SMART assessment. 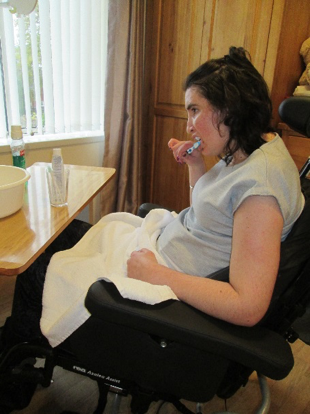 Laura was nil by mouth, required regular mouth care and Yankeur suctioning every 2- 4 hours. She was PEG fed. During oral trials at Moseley Hall Laura had previously aspirated and was admitted back to The Queen Elizabeth Hospital with aspiration pneumonia. Laura was doubly incontinent and was managed with pads. She was communicating using her eyes but very inconsistently. She had increase spasticity in the right and left upper limb requiring splints to maintain joint range as well as having botulinum injections. She also required ankle and foot orthotics for both right and left lower limb and as a specially made soft cast to maintain her hamstring length. Laura transferred with a hoist and required an adapted wheelchair. She had limited sitting balance and only slight head movements. She had no voluntary movements in any of her limbs. Laura underwent intensive therapy at Castel Froma Neuro Care, Physio’s worked with Laura to manage secretions and monitor her for chest infections. Speech and Language therapists focused on communication and swallow. Laura progressed from using eye movements for her communication, and started to use single words. She continued to improve and was starting to take a pureed diet. She eventually progressed so well that she had her PEG removed and was able to manage a normal diet. She worked alongside OT to relearn activities of daily living. 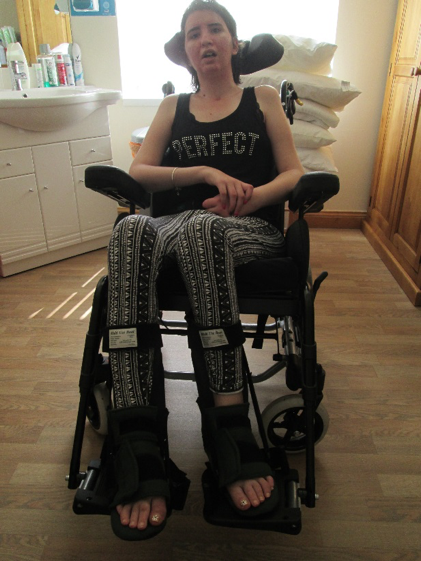 Physiotherapy sessions continued to see successful results, Laura was able to sit independently and roll in bed. She started to complete weight bearing activities and was then able to use a standing aid to transfer from bed to wheelchair. 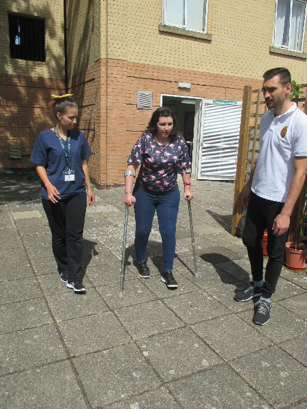 Laura’s improvement meant that the physios required additional support for them NHS services and through excellent communication Laura received further support with orthotics. This then enabled the physiotherapists at Castel Froma Neuro Care to progress Laura’s physio so that she was able to step with support and a gutter frame. She received hydrotherapy in which the therapist were able to challenge Laura further using the principles of water. In October 2017 Laura was discharged home following a successful cranioplasty at The Queen Elizabeth Hospital. The therapy she received at Castel Froma Neuro Care meant that Laura was going home walking with crutches (during therapy she was progressing to no aids). She was eating a normal diet and was able to converse with everybody. 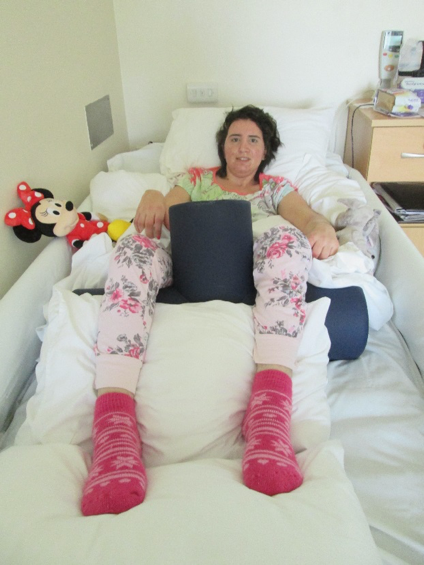 She was able to go to the toilet independently and was less reliant on others for her care. Laura’s family received their wish to have her back at home. Laura will hopefully continue to develop and progress her level of independence. The support of the whole MDT at CF enabled Laura to achieve and exceed her goals and others expectations. Laura will now be at home and hopefully looking for vocational rehabilitation. When I first arrived at Castel Froma Neuro Care I had limited movement, I could only really move a part of my arm as a result of my stroke. I was very stubborn and angry as my previous care home said that I wouldn’t be able to walk again. I felt that I needed a lot of encouragement as I didn’t feel motivated enough to partake in exercise or any of the services on offer. My main goal was to walk again and through the support and encouragement from staff at Castel Froma Neuro Care I was able to become self-motivated and started pushing myself to do more during physio and hydrotherapy sessions. I am now able to walk around the building freely with the assistance of my walking stick. What were your goals when you first got to Castel Froma Neuro Care and how have you achieved them? My main goal was to walk, but I did not feel that I could do it. I feel that through the variety of therapy and healthcare services and the brilliant support of all staff I became stronger in achieving my goal. I feel like this whole experience is surreal to me. The rehabilitation at Castel Froma Neuro Care has made me more independent. I thoroughly enjoyed hydrotherapy and physio therapy sessions as they all contributed to building my strength and motivation to walk again. Occupational therapy sessions have enabled me to re learn the simple things I thought I’d forgotten. The healthcare team also help me with my hygiene routine and dressing myself. In terms of building relationships, members of staff take the time to answer any queries that I have and also go out of their way have conversations just to see how I am doing. Have you got any goals for the future? My goal for the future is to be even more independent and try my best to be the person I was before my stroke. I know I may not completely be my old self but I would like to try and become a better version and work hard. Would you recommend the services at Castel Froma Neuro Care to others? Oh yeah! I would definitely recommend the services at Castel Froma Neuro Care to everyone and anyone. Although I wish some therapy sessions were longer. I feel like they saved my life. I mean they have offered everything to help with recovery. I don’t know what to say, I cannot express my gratitude enough. “It was a bright and sunny summer morning in 2014, I woke as normal to the alarm. But my life changed forever that day, that evening I fell down just 2 steps in the communal hallway at the block of flats where I lived. When I first woke up from the fall I couldn’t remember who I was but I knew instantly that something had changed. What had changed is that I had suffered a brain injury from falling down those 2 steps. I felt completely out of control and couldn’t focus on anything. After suffering the brain injury I became a resident at the Central England Rehabilitation Unit as I couldn’t walk, soon after this I moved to Lillington House. I then moved to Helen Ley which is where I have settled after a great amount of support from Carers, OT, Physios and Nurses. When I first came to Helen Ley I was worried because I didn’t know anyone and at the time I was still very dependent on my family especially my two sisters. They spent a great deal of time with me to try and make my life run as smoothly as possible. The support Helen Ley has provided me with especially the Carers, OT’s, Physio’s and Nurses has helped bring me back from the wilderness. I now feel confident and happy because of all the support I have received from the Helen Ley staff. I can now walk with a tripod and with the Physios I can use a walker, overall through the work of the team at Helen Ley I have been able to persuade my body to get working again. A new development for me has been to go to the hydro pool at Lillington House once a week. I go to the pool with the Physiotherapists and have learnt to walk unaided in the water. I have also learned to throw a ball using my damaged arm/hand. The current in the water enables me to stay afloat as does the constant presence and support of the therapists. It is a great feeling of freedom being able to move unaided in the water. Using the physio gym has played a significant part in my recovery, exercising gets body parts working, it’s not easy but well worth it. It makes every day routines easier to achieve like showering and cooking. I feel like me again now thanks to seeing all the friendly faces at Helen Ley, this being fellow Residents, Carers, Therapists and the Nursing team. It has been very hard work to achieve peace of mind and this has been met by the continuous input from the staff at Helen Ley.